N. Manikandan, M. Dhanalakshmi and R. Dineshkumar. "Comparative Analysis of Adaptive P&O and Fuzzy Logic Controller Technique in Solar PV System." International Journal for Scientific Research and Development 7.2 (2019): 447-453. Mali Dnyaneshwar Jambuvant, Jadhav Vinod Arun, Dethe Kajal Prakash and Shivpuje Dhananjay Bhimashankar. "IoT Based Transformer Monitoring and Control." International Journal for Scientific Research and Development 7.2 (2019): 454-458. Akhilesh Mishra and Tamanna Ashraf Siddiqui. "Enhancing the Reliability of VANET using Markov Chain Modelling." International Journal for Scientific Research and Development 7.2 (2019): 459-466. P. P. Mahajan and S. K. Raini. "To Study the Optical Metallography for Austenitic Stainless-Steel Grade 304 - A Review." International Journal for Scientific Research and Development 7.2 (2019): 467-471. Jatinbhai K. Zinzuvadiya and Dr. H. B. Bhadka. "Survey and Analysis of Scheduling Algorithms for Dynamic Load Balancing in Computational Grids, Cloud and Cluster." International Journal for Scientific Research and Development 7.2 (2019): 472-474. Sanket S Jadhav, Mayuri R Todkar, Swapnali S Shirole, Sayali N Shewale and Prajakta S More. "Automatic Single Phase and Three Phase Load Balancing Based on Transformer." International Journal for Scientific Research and Development 7.2 (2019): 475-476. Sarita Tiwari, Siddhi Kiran Wade, Rinku Uday Patil and Sriram Sayanna Pochampalli. "Prediction of Heart Attack using Data Mining Techniques." International Journal for Scientific Research and Development 7.2 (2019): 477-480. Tejas Pingle, Nikhil Ghatge and Saurabh Bagal. "Occurrence of Porous Asphalt by Mixing Plastic Material." 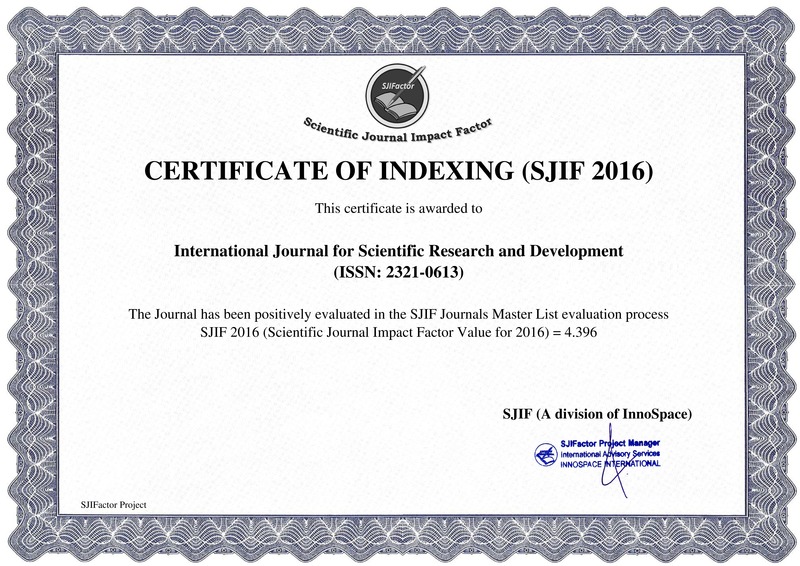 International Journal for Scientific Research and Development 7.2 (2019): 481-483. B. GopiKrishna. "Dynamic Expansion Geo-Dispersed in Cloud Data Centers for Maximization in Financial Benefits." International Journal for Scientific Research and Development 7.2 (2019): 484-488. Omkar Arvind Kadam, Ganesh Dhaku Kolekar, Yogesh Prakash Kanoja, Ketan Sunil Harmale and Sachchidanand Jayprakash Nimankar. "Design and Fabrication of Panic Braking System." International Journal for Scientific Research and Development 7.2 (2019): 489-491.